With engineering, I will gain the skillset to make a difference and leave an impact on my community. Our gender represents 50% of the world’s population; we should be involved in engineering to have a hand in shaping our global society. With more women involved in the field, global growth can increase by $12 trillion, as suggested by a recent study. 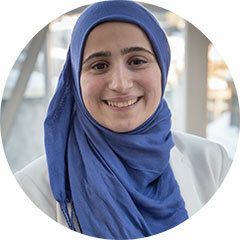 I came to McGill because of its leading reputation and the vast amount of opportunities to experience leadership and gain a strong reputation of successful individuals. Joining engineering at McGill will open more doors than you think possible for your career!